Special Containment Procedures: Any and all instances of SCP-575 are to be immediately isolated and contained with Protocol AL-9O77 (see Advanced Lighting and Emergency Containment Strategies handbook) and transported to secured containment. Should an instance of SCP-575 exceed a safely containable size, Protocol AL-9O77-B is to be used to divide and isolate SCP-575 into smaller instances. Containment units are to be made of two airtight rooms, each sealed by airlocks. The outer room, Containment A, is to remain lit at all times, with no less than two back-up generators on stand-by. Light fixtures are to be checked weekly, and any blackouts in Containment A will result in immediate lockdown until total illumination is restored. The inner containment unit, Containment B, is to be coated in a layer of pure calcium both inside and out. Personnel entering Containment B are to be fitted with LED-embedded clothing and equipped with portable floodlights in case of emergency. Interaction with SCP-575 should be limited to sample collection and observation. Any samples obtained from SCP-575 must be treated in the same manner as the original source and all test areas must have calcium lining and emergency illumination procedures similar to those outlined here. Any and all civilian deaths resulting from SCP-575 are to be attributed to wild animal attack/scavenger predation of an already deceased subject. Should deeper scrutiny be applied, attacks are to be blamed on a serial killer/satanic cult, and any additional information is sealed “due to ongoing investigation”. Description: SCP-575 appears to be an unknown form of matter, taking the form of a series of amorphous black shapes and structures. SCP-575 is difficult to observe, as it immediately dissipates when exposed to light1. Current testing has been unable to identify if SCP-575 is organic or inorganic. Despite the lack of any visible nervous systems or observable organic components, SCP-575 displays behavior consistent with an active consciousness. SCP-575 grows with the absorption of biological material. SCP-575 will “attack” living things by solidifying portions of itself and using these “appendages” to bludgeon, cut and crush subjects. The tracking and selection methods used by SCP-575 are currently not understood. Upon disabling a subject, SCP-575 will forcibly tear and crush tissue within the main mass until it is "absorbed". SCP-575 is unable to interact with objects rich in calcium however, and “nesting areas” for SCP-575 can be identified by the large amount of bones, teeth, and calcified dust around them. 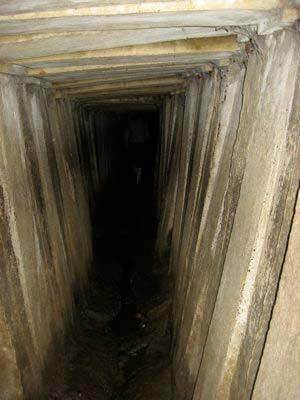 SCP-575 is capable of manifesting in any area of total darkness. This appears to be a form of "spontaneous generation", and can form in any suitably dark location after [DATA EXPUNGED]. SCP-575 was initially recovered under the home of Mr. █████ ███ and his family. When initial contact was made, SCP-575 had "digested" the household, and had partially "consumed" a neighbor, one █████ ████████, age █. Since this initial contact, ███ instances of SCP-575 have been recovered, most of which have been in residential homes or large buildings, such as factories and schools. The cause for this preference is unknown, however it has been suggested that the building behaviors of man simply provide more suitable “nesting” areas, or that SCP-575 somehow "needs" a nearby human presence. Both theories are under investigation.